Die Lunæ, videlicet, 23 die Maii. Sir Thomas Cary and Bp. of Ardagh. Sir Robert Cook's, and Viscount Banning's Bill. and with Orders about the Irish, who come up from the West. Pickis, Lord Dudley's Servant, released. Mr. Thomas's Possession to be quieted. Bp. of St. Asaph's Appearance. Message from the H. C. for Sir Walter Pye to be Deputy Lieutenant of Bucks. Letter from Ld. Howard to the Lord Keeper. and for Committees to meet for putting the Militia in Execution. Clerk of the Crown Leave to go into the Country. Ld. St. John versus Mr. Benyon. 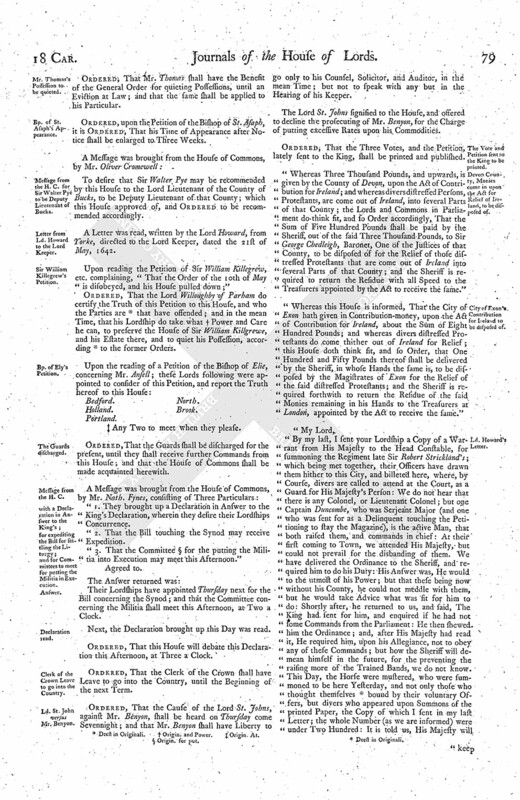 The Vote and Petition sent to the King to be printed. Devon County, Monies come in upon the Act for Relief of Ireland, to be disposed of. City of Exon's Contribution for Ireland to be disposed of. Letter from the E. of Warwick, concerning a Design of seizing the Ships at Hull. 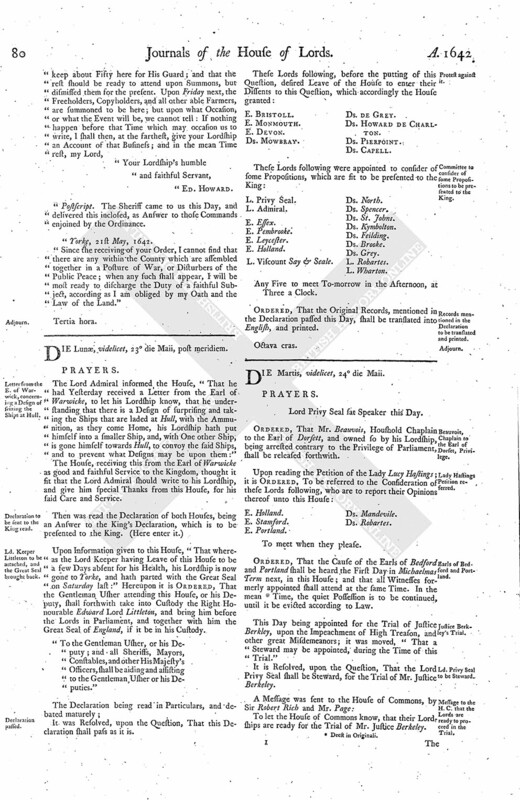 Declaration to be sent to the King read. Ld. Keeper Littleton to be attached, and the Great Seal brought back. Committee to consider of some Propositions to be presented to the King. Records mentioned in the Declaration to be translated and printed. Lord Privy Seal sat Speaker. Ordered, That it is referred to the Lord Privy Seal, to mediate between Mr. Bushell and the Adventurers, that so the Work may go on. Ordered, That the Civil and Criminal Part both, of the Cause of Sir Tho. Cary and the Bishop of Ardagh, is to be heard in this House, on Friday next. To carry down Two Bills, one Sir Robert Cooke's, the other the Bill concerning the Executors of the Lord Viscount Banning, deceased. 1. That the Act passed for paying Money to Scotland, the House of Commons desires that a Committee of both Houses may be appointed to meet constantly, to take Order for the Payment thereof, that so public Faith may be kept with Scotland. Ordered, That this House agrees with the House of Commons in these Two Orders now read; and that the Committee shall be appointed to meet with the Committee of the House of Commons, concerning the Payment of the Money to the Scotts; and that the Committee do meet with the Scotts Commissioners this Afternoon. Ordered, That Agmondesham Pickis, Servant to the Lord Dudley, arrested, shall be released. Ordered, That Mr. Thomas shall have the Benefit of the General Order for quieting Possessions, until an Eviction at Law; and that the same shall be applied to his Particular. Ordered, upon the Petition of the Bishop of St. Asaph, it is Ordered, That his Time of Appearance after Notice shall be enlarged to Three Weeks. To desire that Sir Walter Pye may be recommended by this House to the Lord Lieutenant of the County of Bucks, to be Deputy Lieutenant of that County; which this House approved of, and Ordered to be recommended accordingly. A Letter was read, written by the Lord Howard, from Yorke, directed to the Lord Keeper, dated the 21st of May, 1642. Upon reading the Petition of Sir William Killegrew, etc. complaining, "That the Order of the 10th of May is disobeyed, and his House pulled down;"
Ordered, That the Lord Willoughby of Parham do certify the Truth of this Petition to this House, and who the Parties are (fn. 1) that have offended; and in the mean Time, that his Lordship do take what (fn. 2) Power and Care he can, to preserve the House of Sir William Killgrewe, and his Estate there, and to quiet his Possession, according (fn. 1) to the former Orders. (fn. 3) Any Two to meet when they please. Ordered, That the Guards shall be discharged for the present, until they shall receive further Commands from this House; and that the House of Commons shall be made acquainted herewith. 1. They brought up a Declaration in Answer to the King's Declaration, wherein they desire their Lordships Concurrence. 2. That the Bill touching the Synod may receive Expedition. "3. That the Committee (fn. 4) for the putting the Militia into Execution may meet this Afternoon." Their Lordships have appointed Thursday next for the Bill concerning the Synod; and that the Committee concerning the Militia shall meet this Afternoon, at Two a Clock. Next, the Declaration brought up this Day was read. Ordered, That this House will debate this Declaration this Afternoon, at Three a Clock. Ordered, That the Clerk of the Crown shall have Leave to go into the Country, until the Beginning of the next Term. Ordered, That the Cause of the Lord St. Johns, against Mr. Benyon, shall be heard on Thursday come Sevennight; and that Mr. Benyon shall have Liberty to go only to his Counsel, Solicitor, and Auditor, in the mean Time; but not to speak with any but in the Hearing of his Keeper. The Lord St. Johns signified to the House, and offered to decline the prosecuting of Mr. Benyon, for the Charge of putting excessive Rates upon his Commodities. Ordered, That the Three Votes, and the Petition, lately sent to the King, shall be printed and published. "Whereas Three Thousand Pounds, and upwards, is given by the County of Devon, upon the Act of Contribution for Ireland; and whereas divers distressed Persons, Protestants, are come out of Ireland, into several Parts of that County; the Lords and Commons in Parliament do think fit, and so Order accordingly, That the Sum of Five Hundred Pounds shall be paid by the Sheriff, out of the said Three Thousand Pounds, to Sir George Chedleigh, Baronet, One of the Justices of that County, to be disposed of for the Relief of those distressed Protestants that are come out of Ireland into several Parts of that County; and the Sheriff is required to return the Residue with all Speed to the Treasurers appointed by the Act to receive the same." 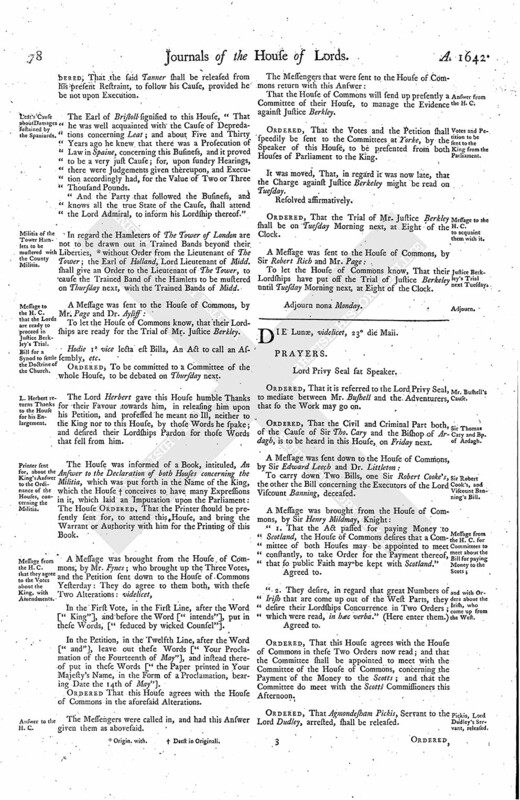 "Whereas this House is informed, That the City of Exon hath given in Contribution-money, upon the Act of Contribution for Ireland, about the Sum of Eight Hundred Pounds; and whereas divers distressed Protestants do come thither out of Ireland for Relief; this House doth think fit, and so Order, that One Hundred and Fifty Pounds thereof shall be delivered by the Sheriff, in whose Hands the same is, to be disposed by the Magistrates of Exon for the Relief of the said distressed Protestants; and the Sheriff is required forthwith to return the Residue of the said Monies remaining in his Hands to the Treasurers at London, appointed by the Act to receive the same." Postscript. The Sheriff came to us this Day, and delivered this inclosed, as Answer to those Commands enjoined by the Ordinance. "Since the receiving of your Order, I cannot find that there are any within the County which are assembled together in a Posture of War, or Disturbers of the Public Peace; when any such shall appear, I will be most ready to discharge the Duty of a faithful Subject, according as I am obliged by my Oath and the Law of the Land." The Lord Admiral informed the House, "That he had Yesterday received a Letter from the Earl of Warwicke, to let his Lordship know, that he understanding that there is a Design of surprising and taking the Ships that are laded at Hull, with the Ammunition, as they come Home, his Lordship hath put himself into a smaller Ship, and, with One other Ship, is gone himself towards Hull, to convoy the said Ships, and to prevent what Designs may be upon them:"
The House, receiving this from the Earl of Warwicke as good and faithful Service to the Kingdom, thought it fit that the Lord Admiral should write to his Lordship, and give him special Thanks from this House, for his said Care and Service. Upon Information given to this House, "That whereas the Lord Keeper having Leave of this House to be a few Days absent for his Health, his Lordship is now gone to Yorke, and hath parted with the Great Seal on Saturday last:" Hereupon it is Ordered, That the Gentleman Usher attending this House, or his Deputy, shall forthwith take into Custody the Right Honourable Edward Lord Littleton, and bring him before the Lords in Parliament, and together with him the Great Seal of England, if it be in his Custody. "To the Gentleman Usher, or his Deputy; and all Sheriffs, Mayors, Constables, and other His Majesty's Officers, shall be aiding and assisting to the Gentleman Usher or his Deputies." It was Resolved, upon the Question, That this Declaration shall pass as it is. Ds. Mowbray. Ds. De Grey. Any Five to meet To-morrow in the Afternoon, at Three a Clock. Ordered, That the Original Records, mentioned in the Declaration passed this Day, shall be translated into English, and printed.